I was the first up this morning and will probably be the last to bed. I started out writing a letter. I actually finished it before Hubby got up. There were no orders to ship today. I am working on hand washing all the wool sweaters which means all the dishes got done. Breakfast consisted of homemade granola and yogurt. With food allergies, everything is made from scratch. The big desk has been void of computer for many years now. That bookcase became a garden bed last year. 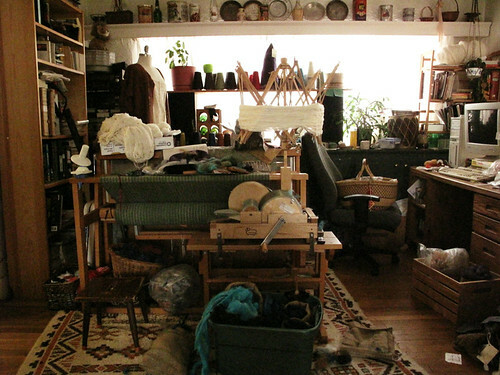 The mess of yarn and piles on top of the loom are constant. So the skeined and dyed yarn was wound into big balls. Then big balls get rewound into one ounce or two ounce balls, depending on the yarn thickness, and labeled. Three crates of yarn were weighed and logged into a notebook since I have yet to get at the computer to repair it. I found another keyboard in the dining room along with a mouse as I cleaned. The new keyboard still has the wrong connector. I started setting up a stable area for staging. Chronographia ran a crowd funder to get her design onto T shirts. She is cleaning up the digital design on her computer to get them printed. I am emptying off the desk and setting up wood crates to hold all the different sized T shirts and hoodies. The desk will be her packaging station to send out the pre-orders. She has all of the shipping supplies and is almost ready to go. 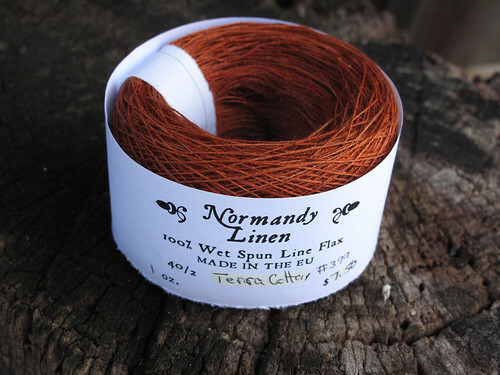 Meanwhile, all my newly wound yarn is ready to go to Gulf Wars. 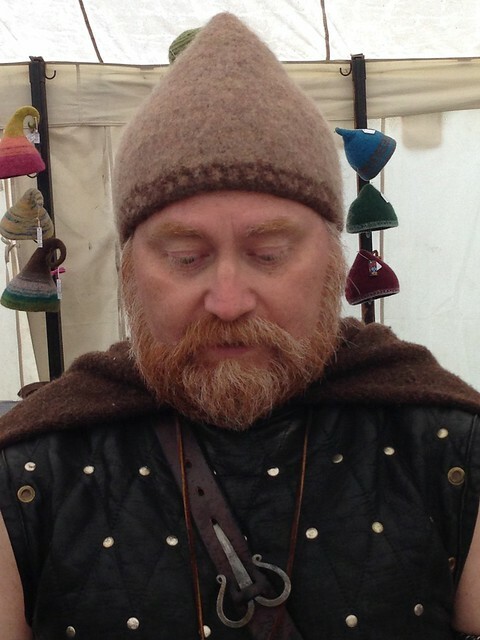 The Pennsic merchant application just came out too. I have a lot of paperwork to catch up on later this week as well as WI sales tax to file. Tonight I cleaned a corner in the living room. I know it doesn't sound like much, but I went through piles of papers. Moved boxes and furniture, then swept the area as clean as I could. Then I swept the dining room. I found more yarn to inventory. Old T shirts got chopped up for dust rags. Slowly, I'm making my way toward the Christmas tree. It has to come down before seed trays can go in front of the picture window. Didn't get that far today. I'll be starting on grab bags of all those little bits of yarn that weren't enough to be a full one ounce ball but still have plenty of yardage. 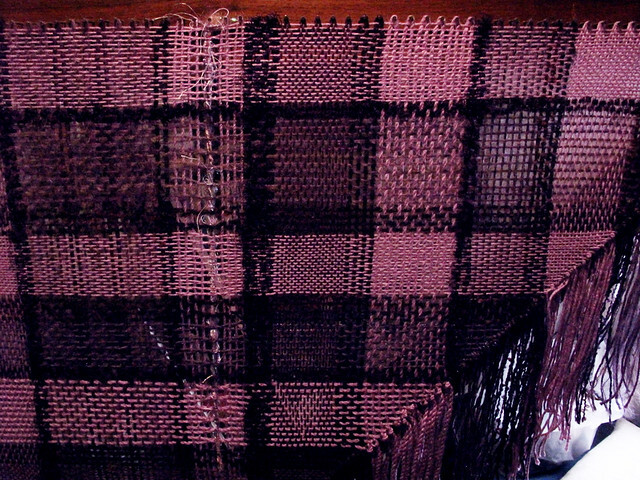 I also want to finish warping a loom. It's mostly warped. And then the floor loom needs the project off it and edges trimmed to sell at Gulf Wars. Tomorrow I have more yarn to wind and then must study for this weekend's gig. 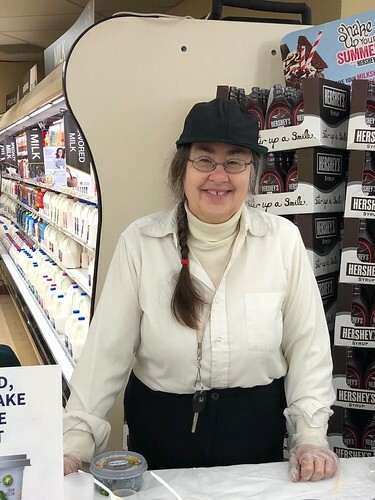 I have three days of handing out yogurt samples at various grocery stores around the area. They call it demo-ing or being a brand ambassador. I need to learn slogans, ingredients, potential allergens, print out time sheets and figure out which store to go to on which day. Hopefully, the kit will arrive with instructions, coupons, and supplies. I supply a table, tablecloth, waste bucket, and probably a cooler. Plus I get to wear my spiffy uniform. Come Monday, I will barely be able to walk. Hey, if I tell you, you'll start bugging me. I'm pretty easy going. Since this is a business page, this section has been heavily edited to maintain professionalism. I will say the high cost of health is up there for annoyance. Our household income just went down by $80 a week because of a healthcare cost increase. That is a lot of money for the poor coverage that the employer chosen healthcare provides. If I had known before January 15th, I'd have found something else on healthcare.gov. Other annoyances, I wish my tea kettle would fill itself along with my ice cube trays. Nine times out of ten, it's me who annoys myself most. I swear I took care of that before I went to bed. Self washing dishes? I think I just need a brownie. Inventory continues. Today's focus was thread. 375 yards per ball takes a long time to wind by hand. So a little slow going. (I really need to save for a new electric ball winder) The light is coming back into the world. I was able to get some pictures today. The goal is to get larger quantities of stuff onto the website. I have a pile of things that need to be photographed. I have some handwork that needs more light in order to get it right. I hope to get a couple of looms warped over the weekend. I have one shawl to finish and block. Weighing fleece is the next bit of inventory. 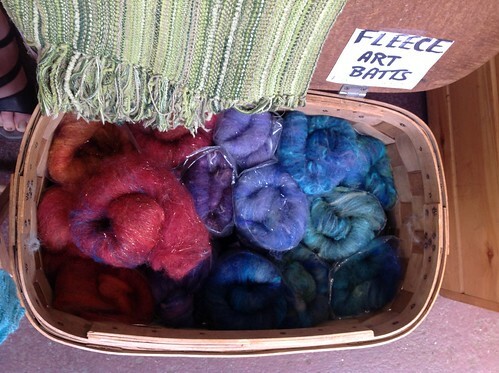 I hope to put together a bunch of blended wool batts like I did last year. I have too much fleece. A lot of it will not work for the type of wet felt hats I want to make. It's a learning process. 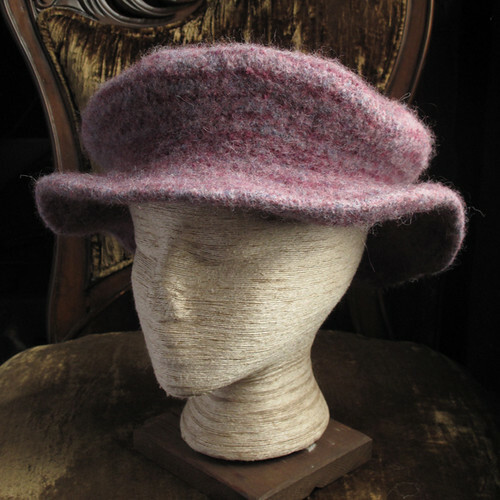 The hat stiffener doesn't soak in evenly even though the fleece felted nicely. The fleece was too hairy or perhaps had too much of a halo. It keeps the stiffener on the surface so it doesn't soak in. For whatever reason, my stash will spin up nicely for someone else. I have enough for my own spinning needs. I must have 30 pounds at least. Studio 360 re-aired a piece about Disneyland. Patrons get to experience an idyllic world. They never see how much effort goes into the production, the layout that allows the cast to get from the parking lot, into costume and makeup, and onto the stage. It's a tremendous effort with careful consideration, practise, and planning. A lot of parallels to the small business owner, especially those who make their own products. Maybe it should stay that way. It's wonderful to see a whole crayon box of colorful yarn. It opens your mind to the possibilities of projects that you yourself can create. You see an entire tent filled with a portable yarn store. Or perhaps you are walking into a sheep and wool show, where you see row upon row of vendors in each barn, yarn all arrayed like a rainbow upon the wall. There is a tremendous amount of work that goes into each display. That work should make your experience at the festival a good one. This is also my time of year to think about how to give you the best experience. So today starts inventory. 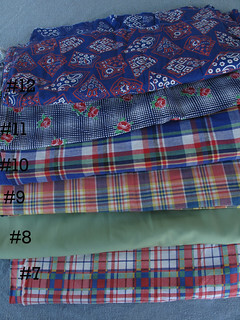 Randomly, I chose 10/2 cotton to start the process. I don't just count it for IRS purposes. I look at what's missing in the crayon box. I clean shelves and peek behind in case something fell behind the shelf. I am winding about a dozen new balls each day so that both the etsy site and the crate of yarn for the next show is complete. I make lists of missing colors to reorder. The process takes a long time but it is so worth it. Because after a hiatus from doing shows over the winter, I am bound to forget something at my first show of 2015. As I work through the items, pictures get taken and more items make their way onto the website for your perusal. If you don't see an item, you can always convo me on etsy or by email. Often stuff just doesn't get as far as the website. Or it's too cold, wet, or windy to get a picture. Also after inventory and lists are made for reordering, sometimes mills or publishers will discontinue items in January. I try to keep up with these. In January, check http://UrsulasAlcove.com for a list of what's new and what's gone. I hope you all have a lovely holiday season and your projects go smoothly! Wishing one and all a good start in 2014. Although I don't go in for New Years resolutions, it occurred to me I probably should post something this month. Winter has set in with a vengeance in many parts of the country. It's a good time to sit back and reflect, plan new projects, or finish some old ones. Myself, having learned to knit socks, I now appreciate how much work goes into this simple garment. I am hoping to get to that pile of clothes that needs mending. Among them are many wool socks with holes. I think today would be a good day to start. That fact that it is now minus eight degrees just seems to emphasize that point. We'll see how far I get. There are many projects calling for my attention. After doing some inventory, it occurs to me between my daughter and myself, we used a lot of yarn this year. How much yarn? I used 61 pounds between knitting and weaving. My daughter used about 30 pounds to knit with. It might be a good idea to order some more as we are starting to run low. Inventory should be complete by weeks end. It went faster this year. I don't think I have less stuff but I'd like to think I'm a little more organized. 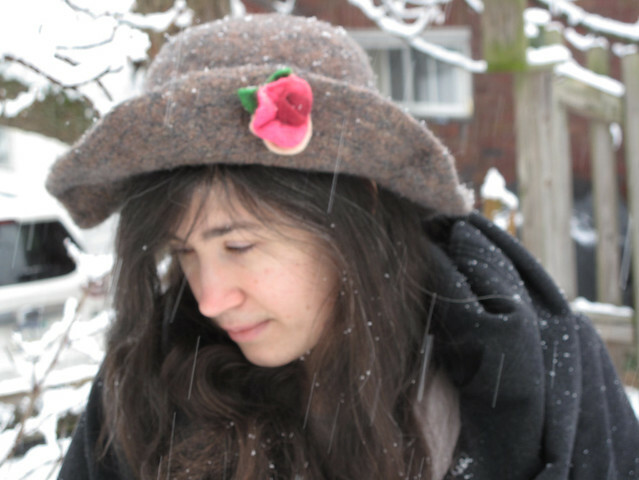 I've already finished two hats and most of a scarf this year. I wanted to work on the webpages too. I need to find the balancing point between creating and selling. The webpage threatens to take over my life. It is our only source of income at the moment. That puts a lot of pressure on me to get items listed. I hope to share some pictures later in the week once the temperature hits a positive number. Our house lighting makes for very bad pictures. So each item on the webpage has its picture taken outdoors. Stay tuned and see how far I get! As I inventory, I start reorder lists as well. Oh the lack of green! Apparently the mill was out last time I ordered. Its a sad state of affairs. 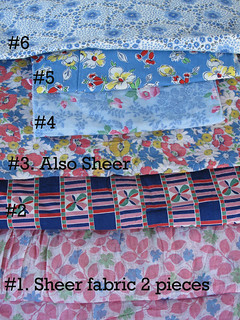 I still need to poke through the 5/2 cotton. Maybe later today. Then there's the zephyr. 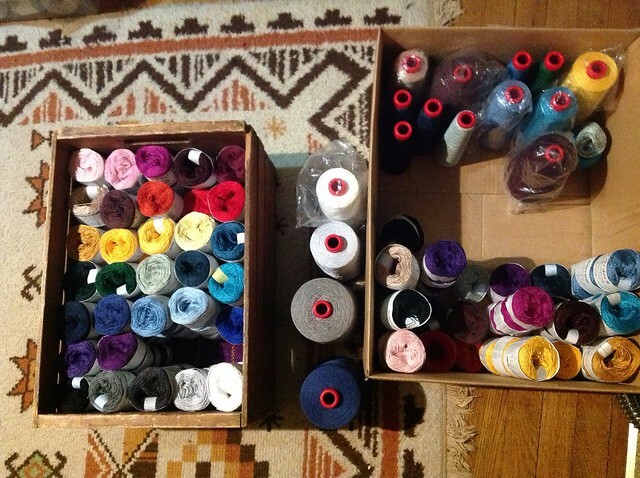 So much yarn, so little time! Errands need to happen as well. Hubby applied to a firm that wants a physical application faxed to them. Nothing like old school for a software technology provider. I wouldn't bother. Its just an agency and one with a bad reputation to boot. Or maybe its a government job. Who knows? Sunny with a high in the sixties. I'm off to enjoy it while I can! The show lasts all of 5 and half hours so come early! Saturday May 11th from 9 am to 2:30 pm at the Boyd Community Center, Powers Run Road. Look for the pop up with the brown thatched roof. Saddlebag in progress - lining too small. Needs new fabric fitted to bag. Not this time. Dyed lacey shawl green - gapping hole - becomes something else- maybe felt later. Dandelion yarn complete. But not for this show. 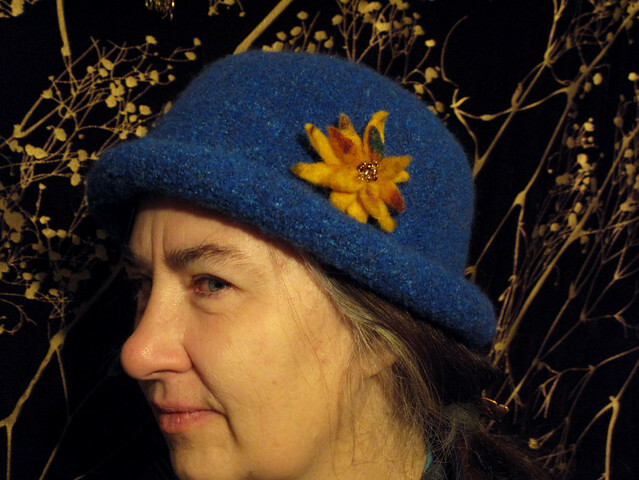 Will be at Great Lakes Fiber. Rhubarb ready to dye yarn. Orange felt hat cut but not sewn. Fingers need to heal first. Girl genius here fixed the ball winder. Life is infinitely better. Winding off the 2/24 thread can only be done this way. Only lost 3 balls of yarn to self-destruction. I need tools people! The world is full of metric and ye olden toolbox is not. Peasants! You can't expect miracles with bearskins and stone knives! Fabric is happening. 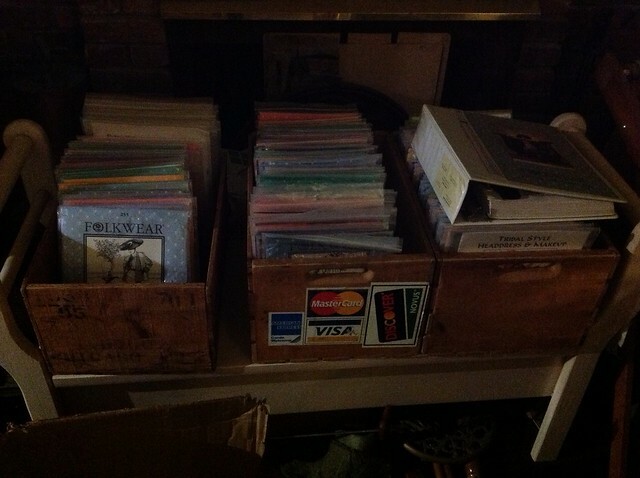 Going through the attic to free up space. I hear it's the final frontier. I needs it. I wants it, precious. 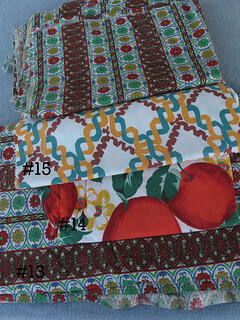 Here's some vintage fabric going cheap. 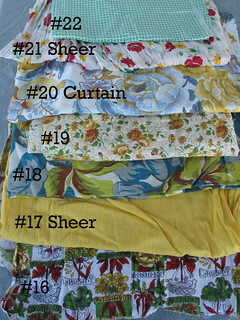 Some is up on http://www.ursulasalcove.etsy.com and some needs to be ironed for bootiful photos. Email me if you're interested. Doubly poignant - Hubby lost his job today. So I am looking for cash in the attic. Sold a bit today already. Email to see what's left. I forgot all about the wonderful part of inventory, discovery. 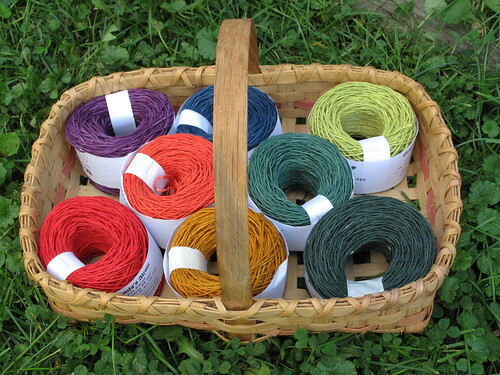 Opening tote after tote of hand dyed yarns, finding memories of rainbows hidden on your shelves. 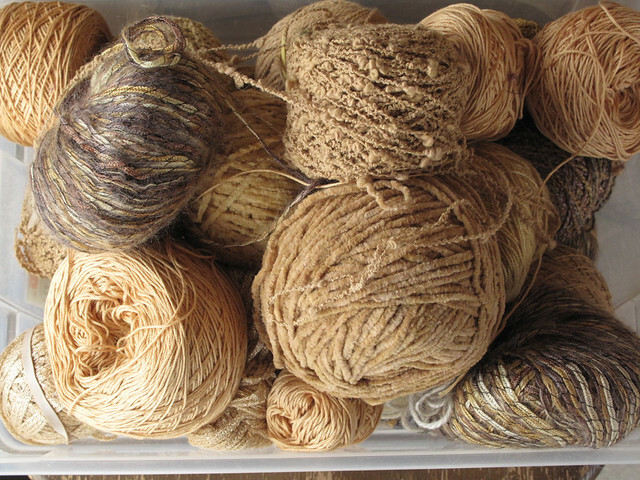 I want to go play and weave with my newly discovered old friends. Unfortunately the only game on the itinerary is 4 and 20 Blackbirds. Today I am the king, counting in his counting house. There's a lot more to count. I hope to get at some yellows later. I have something special planned for them. The yellow has a lot of texture. It could be interesting. I think I need a contrast color though. I know I did work today. I got up at quarter to nine and its thirteen hours later. I wound off a pound of linen by hand. Filled an order, went to the post office, and did a couple of dishes. I started on a swatch to check gage and knit one repeat on my socks. It doesn't feel like I got anything done. Just logged in one project basket of yarn into inventory with Jen's help and some of her hats. I haven't even turned on the TV. Did winding the yarn really take that long? Have I fallen through a time warp? I didn't even cook anything today! It must be Facebook. I must have gotten sucked in. Note to self- Stop it! Just the start of a long involved process. Look for hats made in this rainbow of colors in 2013. The linen and hemp are waiting for me to get them skeined for the dyepot. 10/2 Cotton is underway. 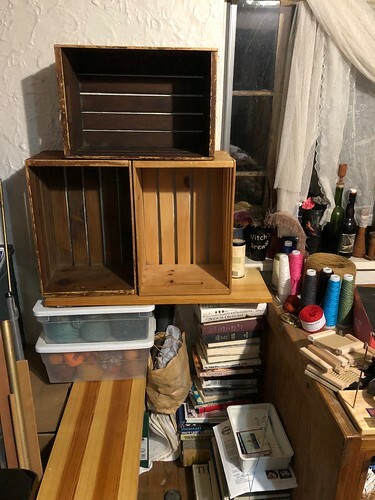 Winding, labeling, data entry, pictures for etsy, and finally back to it's shelf or in the case of the crate, out to the "warehouse" for the next show. Shipping containers with cones adorn my living room. I've way too many boxes. 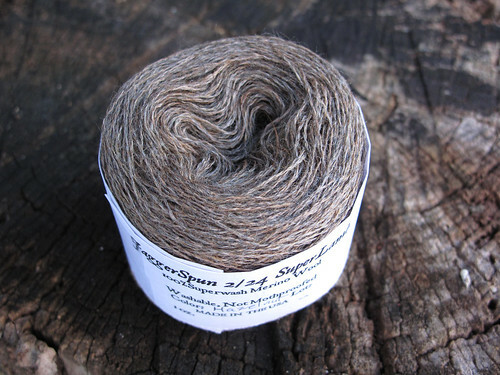 I've 4/8 Zephyr, Organic Wool, and odds and ends. Invoices to enter, more pictures to take, year end inventory, and etsy pages to create. I get tired just looking at it. Someday I'll be able to reclaim my couch and the rest of the furniture. And you imagined I hung out, relaxing in the off season. This is just the first floor. I have five containers in the garage to inventory plus the entire attic which really scares me. We postponed picking up my hubby for Christmas until the winter storm finished passing through. So instead of shopping for food yesterday at the Pgh Public Market, we drove 12 hours. The snow finished up at noon. And we headed off to Detroit. We arrived just in time to get caught in the football traffic. Had a nice dinner together, packed up John's stuff and headed home into the night. Traffic doesn't exist at 1 am. It was great driving. Today I had to do yoga to undo the damage caused by driving in a small car for hours on end. I will be so glad when John gets his cataracts fixed. I can manage the six hours but 12 is too many. Dishes have been accomplished, cat food obtained, and there are more chores in store. I also knit way too much on the snow day. There was not much light. It was a grey vampire world on solstice. I'll be nursing those muscles for a while. Today is such a contrast. With traces of snow left and a cloudless sky, its incredibly brilliant outside. Today is a melting day. The plants are green and happy. Except the coral bells which are burgundy normally. 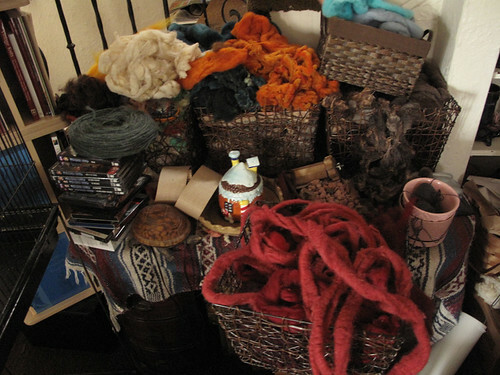 I would love to start spinning and dyeing but first must come the dreaded INVENTORY. This could take a while. There are lots of displays to go through and yarn to wind. (but I want to play!!) I guess the sooner done the sooner I can play. But I'm gonna pout for a bit anyway. Just Things . . . Inventory. I hate it. I love it. It's tedious especially doing it alone. It takes me forever. It's not just about inventory. 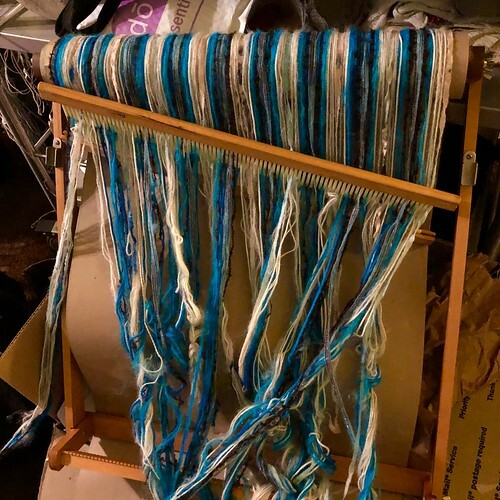 It's winding all those balls of yarn for displays, making pretty skeins, labeling all those hats, updating the database, trying to figure out what that ball of yarn was back when it had a label. Then there's the joy of discovery. Ooo! I love those two colors together. Do I have enough to make anything out of it? Oh, that missing ball of golden fleece fell behind that bookcase, I've been looking for that for a long time. Each new bag of old yarn uncovered makes me what to play all day instead of counting or weighing it. There's light at the end of the tunnel. Only another week of this. 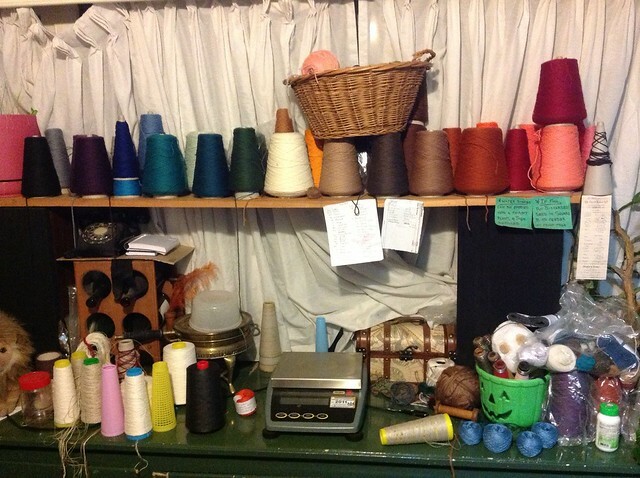 Eight skeins of alpaca to wind, three more tubs of fleece to sort and weigh, and dozens upon dozens of socks to count. Notions to count and package. Then comes the WTF yarn. It's not labeled and a guess as to if it's even in inventory and the forgotten or not-quite-right projects. Hats that don't fit human heads. What exactly do I do with them? There must be a creative way to make them work. A brief interlude of winter occurred this week. Monday will be time enough to get back to projects like the scarf. After taking it out of the bag, I got ghost outlines of leaves. I should've left it longer. The leaves are a bit long in the tooth. Autumn was a long time ago. So I will give it another go and let it sit longer or use Martha's hammer.